UPDATE: Congrats to Carol W. and Michael Bernadette, who each won 2 tickets to the premiere of ParaNorman! Please email me at losangelesstory@gmail.com with your first and last names, email address and cell phone numbers by 2 p.m. today. (I'll have to pick another winner if this info is not received.) Thanks to everyone who participated (and to Random.org for helping me choose). Just in case you didn't get enough of the new Focus Features stop-motion animated film ParaNorman in my previous post, I have even more news! The film, which will be hitting theaters Aug. 17, will be having its world premiere at an as-yet-undisclosed Hollywood theater on Sunday, Aug. 5, and I'm giving away 2 pairs of tickets. So, for all you stop-motion fans, or Coraline fans (ParaNorman is from the same company, LAIKA), director Sam Fell (The Tale of Despereaux) fans, actress/mom Leslie Mann fans, or fans of misunderstood young boys who can see and talk to dead people, this giveaway is for you. To enter, please leave a comment below telling me why you'd like to go to the premiere. Please also include your email address for quick contact. Sunday, Aug. 5 @ 2 p.m.
Have you seen these posters and billboards around town? They're everywhere! 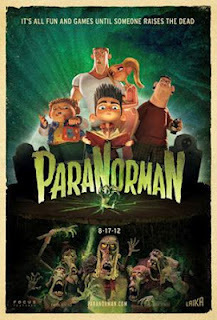 They're from Focus Features' new stop-motion animated film ParaNorman, which opens Aug. 17. I am in such awe of stop-motion animation. We're big fans of Wallace & Gromit movies, and CC and I enjoyed Coraline (in fact, everyone kept calling her that when the movie came out a few years ago). It's amazing the kind of patience those artists must have. This new kids' movie is from the makers of Coraline and, once again, delves into some relatively eerie subject matter (eerie, that is, in a PG way, which is what the film is rated). Norman, according to press notes, is a misunderstood boy who can speak with the dead, and he takes on ghosts, zombies and (gasp!) grown-ups in order to save his town from a centuries-old curse. Some famous voices in the cast include John Goodman, Leslie Mann, Casey Affleck, Anna Kendrick and Christopher Mintz-Plasse. Here's the trailer, and right below a little peek inside the stop-motion magic. I always like sharing free "Coming Attractions," and this looks like a good one. I know it's in the O.C., but it would be worth the drive. Disney Junior Story Magic is teaming up with CC fave the Story Pirates for a free event on Saturday, July 28 at Westminster Mall. The duo will host a live interactive sketch comedy performance that will spotlight kids' creativity and storytelling chops. Not only will the Story Pirates weave kids' ideas into fun performances, but Disney Junior will be giving away Jake and the Never Land Pirates bandanas, too. CC is a huge fan of Disney Junior's Jake as well as the Story Pirates. It's really amazing how much creativity goes into the latter's live shows. And to know that it's all kid-driven makes for twice the fun. Let me just say that Martha Stewart looks amazing. Seeing her rock an omelet while wearing heels at this weekend's PBS Press Tour at the Beverly Hilton, you wouldn't believe she's about to turn 71. Some MomsLA friends and I were front and center at her panel, which offered a preview of her upcoming PBS show, Martha Stewart's Cooking School, debuting in October. Her new program, inspired by her book of the same name, will focus on classic cooking basics and techniques -- something I could definitely use myself. She was hilarious in the demo/panel -- and quick on her feet. When poor Todd VanDerWerff from The A.V. Club (pictured above) tried to make an omelet alongside Ms. Stewart, she deadpanned that she was afraid of what he was making. When she was trying to think of the name of a historical figure, she finally sighed and said, "Ken Burns would know." The famous documentary filmmaker just happened to be sitting at one of the front tables in the audience and got a big laugh out of that one. 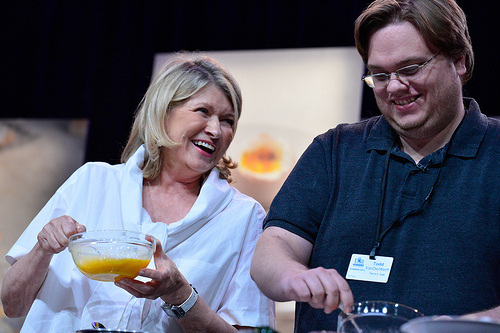 In true Martha Stewart fashion, she had everyone working -- not only the volunteers on stage but also the audience. She brought jars and ingredients for each of us to make our own vinaigrette -- something, she said, we should never buy in the store but instead make ourselves. I'm looking forward to checking out the show. Ian and CC, I'm sure, would be happy for me to learn some new tricks when it comes to cooking. CC gives a thumbs up to her 'Brave' Mattel toys. UPDATE: Congrats to Noreen, who won the Brave goodies. Please email me at losangelesstory@gmail.com with your name and address. Thanks to everyone who participated (and Random.org). When CC and I saw Disney*Pixar's Brave in theaters last month, that wasn't the first my little munchkin had heard of the strong-willed main character, Merida. CC was a fan even before the animated Scottish princess hit multiplexes. Besides billboards and posters, CC was mesmerized by the previews, which showed an independent girl who wanted to make her own decisions -- in spite of what her parents were suggesting. Yeah, that sounds a lot like my own little strong-willed girl. 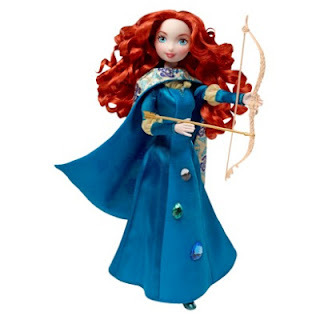 As part of the Mattel Disney Insider program, we also had the chance to check out Mattel's new line of Brave toys, which includes the Brave Gem Styling Merida doll ($20.99) and the Brave Castle and Forest Playset ($26.99). CC has been playing with both items for the past several weeks and has had such fun with both. The larger Merida doll sports her signature blue gown (which CC has in her own size! ), as well as some awesome gladiator-style blue boots that CC loves to take on and off. What's also fun are the Velcro jewels that come with the doll to mix and match over her cape. Merida has had a lot to share with CC's other princess dolls, Snow White and Cinderella. They all seem to be BFFs now, at least according to the conversations I sometimes overhear in CC's room. 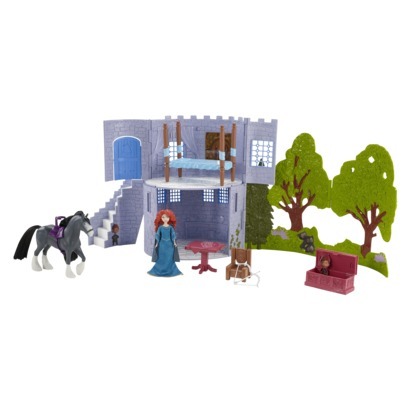 The castle and forest playset have enjoyed countless hours of playtime. I love watching CC make up stories for the castle -- and especially for Merida's horse, Angus. In fact, while the smaller version of Merida, which comes with the set, has been making the rounds around CC's room, CC has placed a new tissue saddle on the mini horse while letting various other toys ride him. 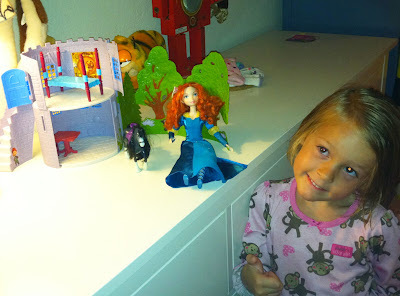 I'm giving away 1 Brave Gem Styling Merida Doll and 1 Brave Castle and Forest Playset. To enter, leave a comment below about your favorite part of Brave. Good luck, and I will announce the winner on this post on Friday, July 27! UPDATE: Congrats to MLRhino, who won the American Girl: McKenna Shoots for the Stars DVD! Please email me at losangelesstory@gmail.com with your address, and I'll send it right away. Thanks to everyone who participated! CC hasn't yet joined (or really discovered) the American Girl craze, but I have a feeling my days are numbered on that one. Especially now that we've seen the latest American Girl DVD McKenna Shoots for the Stars, which hit shelves July 3 (SRP: $14.99) from Universal Home Entertainment. We watched a review copy this weekend, and both CC and I thought this was great girl-friendly entertainment. Nia Vardalos (My Big Fat Greek Wedding), Ian Ziering (Beverly Hills, 90210) and gymnast Cathy Rigby star in the movie, but it's really Jade Pettyjohn, as McKenna, who should get the most attention. The story focuses on McKenna, a talented young gymnast who has her priorities a bit out of whack -- something every young girl faces when she's great at something. Of course, when you're in the fourth grade, it's really school that should take a front seat. Not so, in McKenna's eyes. For her, it's all about scoring a spot on the elite regional gymnastics team. With her grades slipping, McKenna's teacher suggests she get a tutor, which makes McKenna feel embarrassed and, shall we say, less than scholarly. But when she takes a bad fall during practice and is stuck with crutches, she is given the opportunity to improve her grades -- while gymnastics takes a back seat. McKenna Shoots for the Stars touches on a lot of issues that young girls -- and boys, for that matter -- have to deal with. Embarrassment, falling behind, having to make tough choices, and what that might do to friendships. The movie handles all of these issues with care, while empowering kids to make those tough choices and to let them know it's OK to ask for help -- something even grown-ups have a hard time doing sometimes. I was happy to see the positive themes, while CC had fun watching the gymnastics and asking questions about the girls' feelings and friendships. I would recommend this for any parent to watch with their child. I also appreciated that the movie stood on its own, rather than as an extension of a brand. I'm giving away 1 copy of McKenna Shoots for the Stars on Blu-Ray + DVD (SRP: $14.99). To enter, leave a comment below about your experience with American Girl -- or with how you've had to deal with a tough school issue. Good luck, and I will announce the winner on this post on Monday, July 23! 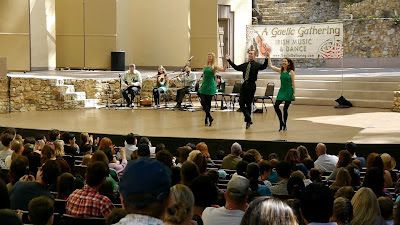 CC was literally dancing in the aisles at this lively performance from Irish music and dance troupe A Gaelic Gathering, which kicked off this year's Big!World!Fun! series at the Ford Amphitheatre. The Los Angeles-based troupe, led by Maire Clerkin, entertained the ample audience with hard shoe jigs, soft shoe reels and lovely Irish songs sung by lead vocalist and accordion player Alice Ryan. The crowd was clapping and whistling, as a trio of dancers did things with their legs that seemed to defy the reality of human anatomy. (I'm assuming they really do have bones!). It was amazing. So amazing that CC jumped out of her seat and started dancing, along with other little girls and boys in the crowd. It was fun watching them have such a great time, and it was also fun watching the performers on stage watching the girls! Everyone was loving it. And that's what's so wonderful about this series. Big!World!Fun! introduces kids and families to different cultures through music, theater and dance, and they invite kids to enjoy it the way kids do -- moving, clapping, talking -- without the stress of having to tell them to sit down and be quiet. Hope you get a chance to check it out this summer. Here's my post about this year's lineup and ticket info. And don't forget how wallet-friendly this outing is. Adults are $5, while kids are free, and parking is only $1. Chudney Ross reads from her book, Lone Bean, at Books and Cookies. A couple of weekends ago, CC and I visited the adorable Santa Monica bookstore Books and Cookies to hear the owner, Chudney Ross, read from her new children's book, Lone Bean. We love visiting the light, bright and colorful shop just off Main Street. In addition to reading various books around the store -- and devouring a cookie or two -- we heard an excerpt from Ross's book, about a little girl who has a rough start to third grade. Not only does she have m-e-a-n older sisters, she also finds out that her best friend has found a new best friend. But perhaps the biggest surprise was meeting Chudney Ross's mom, the uber-famous Diana Ross, who was there to cheer on her daughter. In fact, Chudney had dedicated the book to her mom. It was pretty cute. Just before Chudney read, she sang "If You're Happy and You Know It" and "Twinkle, Twinkle Little Star" with the kids. I had a starstruck moment as I was sitting next to Diana Ross, who was singing "Twinkle Twinkle!" Crazy! While CC might not have known exactly who she was sitting next to, I was thrilled that she'll be able to look back on this and say she sat next to a legend. Be sure to check out the book. I bought a copy and had Chudney sign it for CC. Can't wait to read it to her -- or, by the looks of it, she might be reading it to herself very soon! 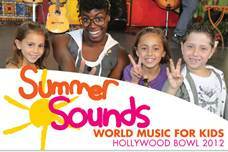 Summer for kids is just getting started at the Hollywood Bowl, and the music-friendly venue is ready to introduce little Angelenos to reggae, Filipino and Latin music with its annual SummerSounds program, kicking off July 9. CC and I haven't checked out this program yet, but it sounds really fun and exposes kids to so many cultures. Not only that, but in addition to hearing live music they also get to make arts and crafts. SummerSounds music and art workshops are held every weekday, twice a day -- at 10 a.m. and 11:15 a.m. The music performance is $7 per person, and the art workshops are $5 per child (must be at least 3 years old). The first two weeks, July 9-20, will spotlight reggae music with leader David Kirton. Kids will learn about the music genre's roots, which started in Barbados. Weeks three and four, July 23-Aug. 3, will focus on Filipino music from the Philippines with Dulce Capadocia. The interactive dance will include the fable "A Crocodile's Tale," a story about trust and gratitude. The final two weeks, Aug. 6-17, will close out the season with Latin music. Trio Ellas will lead the kids in mariachi music with an L.A. twist. Kids will learn about the musical combo of guitar, violin and guitarron. This sounds like such a great time. If you and your kids check it out, let me know how it goes! This is a Sponsored Post from Apartment Guide, written by an Apartment Guide representative. Is your place in need of a style update? Apartment Guide has partnered with TV host and design expert Kim Myles for the second annual Apartment Guide “Your Picks. Your Place.” Sweepstakes. From now until August 14, visit YourPicksYourPlace.com to vote once per day for your preferred room design, showcasing furniture and home décor items selected by featured bloggers. The site will feature four different room designs every two weeks. By voting, you’ll be entered for a chance to win a $10,000 grand prize or one of eight $250 weekly prizes to go towards your own selections for your home. While you’re on the site, you can find design and décor tips from Kim Myles, Apartment Guide and featured bloggers to help you design a room that’s uniquely you. Happy 4th of July! Hope you and your family have an awesome day. We're definitely planning some outdoor time, as well as dinner with friends. Yay! 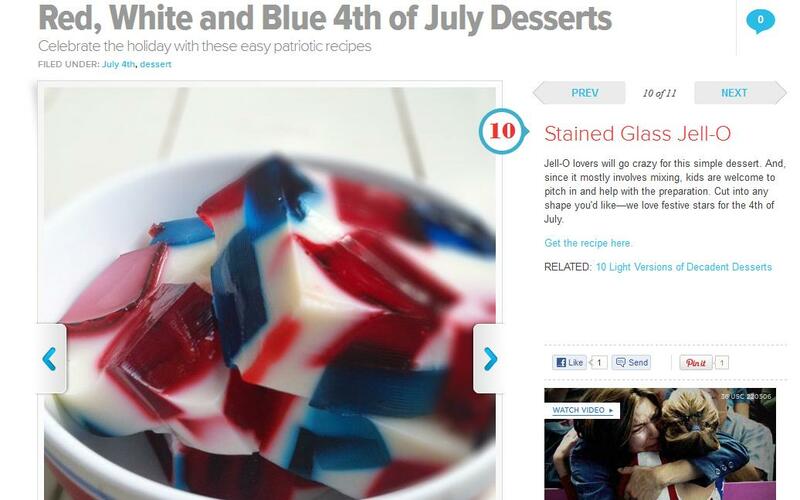 If you need to whip up a fun dessert for tonight's dinner party, check out these colorful recipes from mom.me. The editors and designers worked on each recipe (I made the stained glass Jell-O), and it was a true labor of love! Whatever you do today, be safe and have fun! It looks like another fun summer lineup, as Big!World!Fun! kicks off another season at Ford Amphitheatre on Saturday, July 7. This family-friendly -- and wallet-friendly -- outing is such a great way to get kids moving to the sound of international beats. 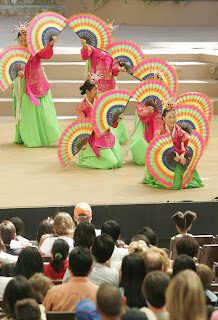 The Saturday-morning programs feature live music, dance and theater performances representing cultures from all over the world. 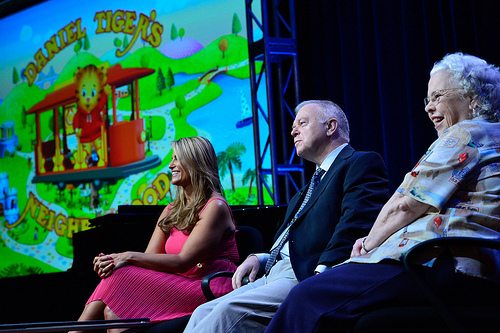 The hour-long shows are geared toward kids ages 4-10. This will be the third year we've taken CC to see a show, and I can't wait. The atmosphere is so happy and laid-back, and the music and dancing has always been reliably fantastic. What's more is that in addition to the show itself, there are pre-show activities before each performance. (Last year, CC touched petrified dino poo, courtesy of Kidspace Children's Museum!) Kids will have the opportunity to craft Celtic trees of life for this weekend's Irish music and dance performance. Here's a rundown of the season, which is scheduled for Saturday mornings at 10 a.m. through Sept. 1. July 7 -- A Gaelic Gathering: Irish Music and Dance -- "Fiddles and flutes accompany hard shoe jigs and hornpipes, soft shoe reels and slipjigs." July 14 -- Contra-Tiempo -- "Contra-Tiempo fuses salsa, Afro-Cuban and contemporary dance to create an invigorating urban dance theater experience." July 28 -- Shakti Dance Company -- "Shakti Dance Company presents classical Indian dance by masterful performers." Aug. 4 -- Kilohana Performing Arts Company -- This company "presents 'Hopoe, the Dancing Stone,' a Hawaiian musical play." Aug. 11 -- La Santa Cecilia -- La Santa Cecilia combines up-tempo South American rhythms, with bolero, tango and more. Aug. 18 -- Jung Im Lee Korean Dance Academy, Hikari Taiko and Yen Yen Dance Group -- "Dancing and drumming from Korea, Japan and China offer families a dynamic exploration of traditional Asian music and culture." Aug. 25 -- The Dustbowl Revival -- This Venice-based roots and jazz collective "merges old-school bluegrass, gospel, jug-band and swamp blues with the hot swing of the 1930s." Sept. 1 -- Viver Brasil -- "Viver Brasil's music and dance brings to life lively stories of West African Yoruba spiritual deities." Yes, it's true! Ian and I are going to have a Baby Clark 2.0! And it's a boy! I meant to write about this several weeks ago, but time has gotten away from me. This pregnancy is definitely going faster -- maybe because I already have a little munchkin that I'm chasing around. And speaking of that munchkin, she's very excited to be a big sister. It wasn't always like that, though. When she found out -- I accidentally slipped -- she got so upset. I think it just took her by surprise. But after I told her all the things she could do with a little brother (dress him up, put on shows for him) and what an amazing big sister she would be, she got a lot happier. Now, she's talking -- more like shouting -- at my stomach and into my mouth, "Baby! Baby!" I'll keep you posted on how things are going, so stay tuned!